Can you believe it is time for Fall Break? 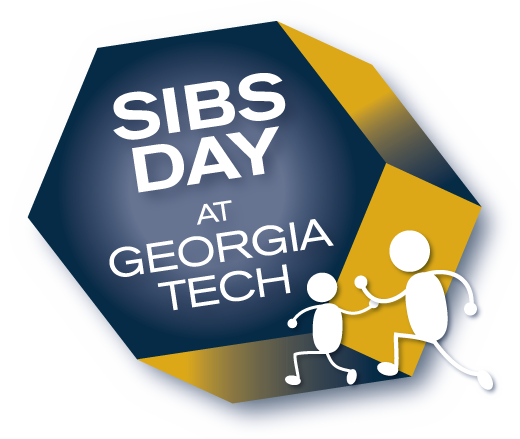 It seems like yesterday that families were preparing to move their students to campus and now Georgia Tech’s Fall Break is next week! Many families are already making plans for Thanksgiving. Thank you again to those who joined us for Family Weekend 2016! We hosted more than 3,600 guests from 40 states and seven countries visit campus this past weekend. It was great to see all the smiles from students and their families as they got to spend some quality time together throughout the weekend. Several parents shared that they were happy they got to help their student relax and have some much needed downtime after a heavy exam week. We will share pictures from the event in our November edition of ParentNews and on our Facebook page. Have a question? 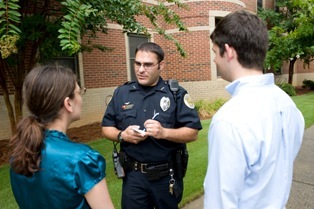 Call Parent & Family Programs at (404) 385-1396 or email us at parents@gatech.edu. Seven Weeks and Counting...What Now? 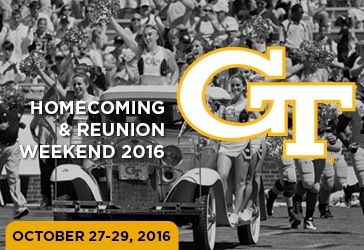 We hope you and your student will join us for Homecoming Weekend 2016. Homecoming is a time to celebrate Tech Traditions and discover Yellow Jacket country. From campus tours to the Ramblin' Wreck Rally Tailgate, the weekend is packed to stir up gold and white pride. For more information and to register for events visit gtalumni.org/homecoming. Seven Weeks and Counting...Now What? Georgia Tech is home to many international students. Over the holiday season, these students are often unable to travel to their home country. Additionally, many of them have never experienced a traditional Thanksgiving. A Home for the Holidays was started in 2014 by the Student Government Association in order to address that need. In order to build a stronger GT community, this program was designed to provide international students the opportunity to experience the Thanksgiving holiday - for many, for the first time - in a local family’s home. We are matching these students with other members of the Tech community for the Thanksgiving holiday! Students will go to the host’s home on Thursday, November 24, 2016 to share a Thanksgiving meal. If you would like to host a student, please complete this form. If your student is an international student and would like to be hosted, please fill out this form. Please apply by November 4, 2016! If you have any questions, please e-mail gtahomefortheholidays@gmail.com. You will be notified if you have been matched the first week of November! Parent & Family Programs needs parents to help spread goodwill and cheer to parents and families of our graduating students prior to commencement on Saturday, December 17, from 7 - 9:30 a.m. at McCamish Pavilion. If interested, email parents@gatech.edu by December 1, 2016. Additional details will be provided to volunteers in advance of the event. Check in with your student to see what their plans are for Fall Break. Some students will travel home, while others will stay in Atlanta and study or take a break and visit some of Atlanta’s local attractions. If they are staying on campus to study, encourage them to take a break to recharge their batteries. Fall Break marks the halfway point in the semester and it is important for students to take care of themselves both physically and mentally. The Campus Recreation Center will be open during Fall Break or they can take advantage of their student discount at the Box Office in the Student Center to use at local movie theaters, Six Flags, and more! What plans are you making for internships or other career-related experiences? This may be hard to believe, but it is not too early for your student to begin thinking about gaining career-related experience for the spring semester or summer. The Center for Career Discovery and Development offers programs and services to help students prepare and succeed with their internship or job search. 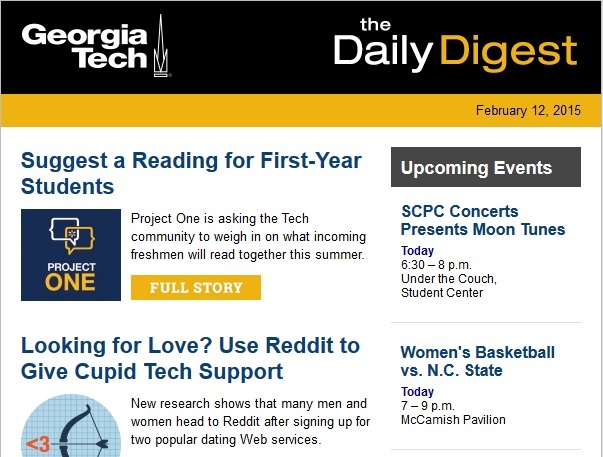 Visit for http://www.career.gatech.edu more information. Have you sign up for our Parent & Family Programs Facebook page yet? Like us today at https://www.facebook.com/GeorgiaTech.ParentsProgram to stay connected throughout the year!